PA chairman claims Palestinians are descendants of the "Arab Canaanites" who built Jerusalem 5,000 years ago. 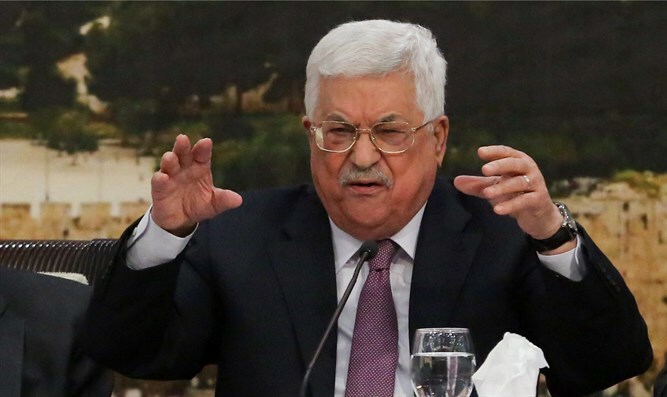 Palestinian Authority (PA) chairman Mahmoud Abbas on Wednesday rejected any possibility of giving up on the issue of Al-Quds (the Arabic name for Jerusalem –ed. ), which he called "the eternal capital of Palestine." In a speech to the Al-Azhar Conference in support of Al-Quds, Abbas emphasized the right of the Palestinians in Jerusalem is based on the "history" and the direct link between the Palestinians and their Canaanite "ancestors" whom he called "Arabs." Canaanites were, in fact, pagan idol worshipers who disappeared centuries before Islam arose, as Middle East expert Prof. Nissim Dana pointed out in an interview with Arutz Sheva in 2016. This is not the first time that Abbas has claimed that Palestinian Arabs are related to Canaanites. He has in the past claimed on official PA TV that a "Canaanite-Palestinian" people dating back over 6,000 years had existed, and further asserted that this people invented an alphabet. Similarly, former PA chief negotiator Saeb Erekat once claimed his people have lived in the Land of Israel for thousands of years.